Friending is here! 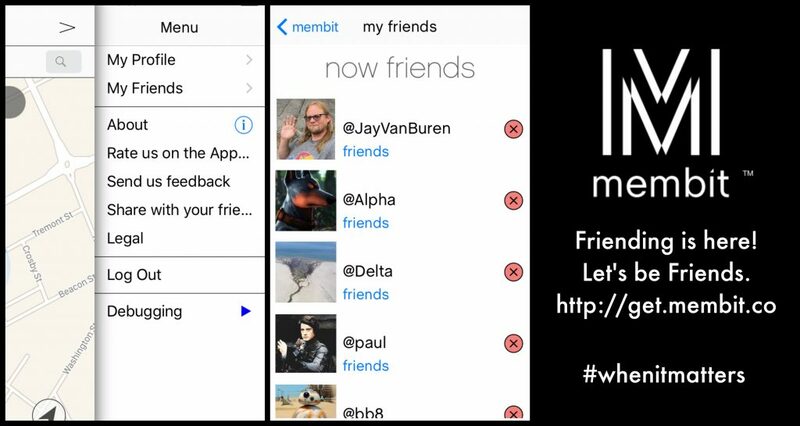 – Membit Inc.
Membit is excited to announce our long awaited new feature of friending. We’ve always known it was really important to allow people to connect on the app and also have ways to adapt the levels of privacy for friends vs public. So we’ve been working hard on our new features that allow you to do just that. Create your dashing new profile. Let the world know who you are and what you’re about. Start to connect with your friends. We know you’re a trailblazer, so we’ve made a way to invite your friends in the menu where it says “Share with your friends”. Change the settings on the pictures that you share to be private, friends only or public. We hope you dig this new part of the app and welcome your feedback.